CWPD Rocks 1,000 Member Celebration! Home / 2017 / September / 25 / CWPD Rocks 1,000 Member Celebration! Introduced to the community in March 2017, the CWPD Rocks Facebook group has reached 1,000 members! Celebrate with us! We’ve hidden these 10 rocks throughout the Park District’s 50 parks. If you find one, bring it to park headquarters to trade in for a prize bag that includes CWPD swag, rock painting supplies and a $5 gift card donated by Learning Express! Headquarters is located at Activity Center Park. Office hours are Monday – Friday, 8 a.m. to 4:30 p.m.
New to CWPD Rocks? It’s a rock painting movement created to make you smile! Community members paint rocks and hide them in CWPD parks. When you find a CWPD rock, snap a photo and post it to the CWPD Rocks Facebook Group. Or post it on Twitter or Instagram with the hashtag #CWPDrocks! Anyone can get involved with this project! 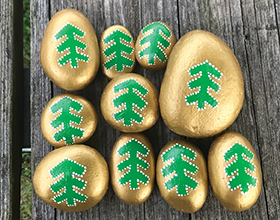 Paint (acrylic paint and sealer recommended) your masterpiece on a rock and add #CWPDrocks to the bottom. Then place it in your favorite Centerville-Washington Park District park! You can post clues to your rocks on the group or just let people come across them on their own. If you find a rock, you can either hide it again or keep it for your collection!